The Black Abolitionist Papers (BAP) document the struggle for abolition from the perspective of African Americans both free and enslaved. The digital collection consists of the correspondence, speeches, sermons, lectures, editorials and poems of close to three hundred African American abolitionists. Some of the voices are familiar such as those of Harriett Tubman and Frederick Douglass, others are less well known or disguised behind pseudonyms. The original sources are located in over one hundred archives and libraries. Over thirty percent of the sources are hand-written letters and documents. Previously only available on microfilm, the collection can now be accessed online by Villanova faculty and students. Access links to BAP can be found under Databases A-Z, in the library catalog and under the primary sources tab of the history subject guide. Collection contents can be browsed and results can be narrowed by document type, time period, subject, geographic location and source library. A personal, password-protected archive is available to store documents, citations can be exported to RefWorks and persistent URLs make sharing with colleagues and students a snap. Short online tutorials introduce the novice to the collection’s search features. Charles Lenox Remond to Richard Allen, 7 January 1841 . Rhodes House—Oxford, England. MSS, British Empire, C154/202 . 7 January 1841. 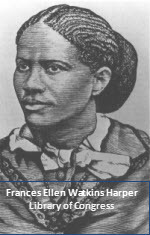 “Bury Me in a Free Land” by Frances Ellen Watkins Harper. Anti-Slavery Bugle . 20 November 1858. Includes biographies, subject entries, primary sources, maps, charts and tables. Notable titles in this collection are the New Encyclopedia of African American History 1619-1895 and the African American National Biography Project. Comprises major 19th century African-American newspapers such as The Christian Recorder (1861-1902), Freedom’s Journal (1827-1829), The North Star (1847-1851), and the Frederick Douglass’ Paper (1851-1863). Includes abolitionist periodicals such as the Liberator (1831-1865) and the Anti-Slavery Examiner (1836-1845).